Hi friends! I hope you are well. We are a bit under the weather again. Please think positive thoughts for us that we are well for Christmas! I'm hoping! Here's a project I made for the Whisker Graphics Blog. 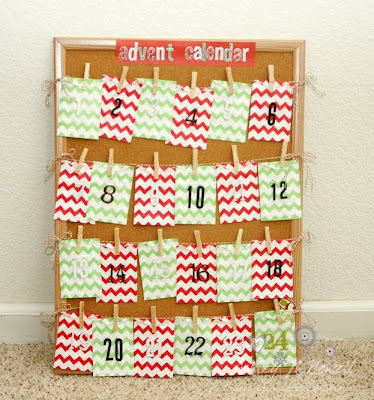 It's an activity advent calendar. Each Chevron Little Bitty Bag holds a different activity that we will do with the kids each day. I made this by stapling some Holiday Divine Twine to an inexpensive cork board and then using small clothespins to hold the Bitty Bags. I put Thickers numbers on each one and used Thickers and some Bella Blvd paper to make the sign at the top. Here give a nice post. It is a calendar of coming events. Chevron each hold a small little bags of different activities, we will do with the kids every day. I did some holiday sacred rope, binding a cheap cork board, then hold small bags with a small peg. LOOOOOVE how this turned out!! LOVE the bags!!! Love your Avent calendar, so cute!